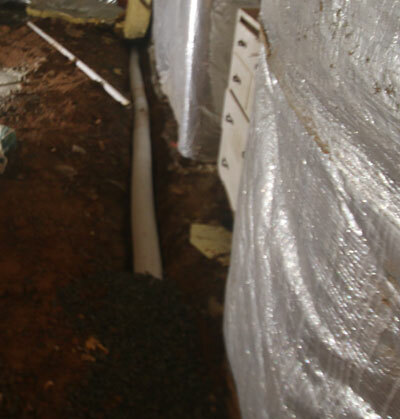 Crawl Space encapsulation Water Proofing Contractor Northern Virginia is Fairfax Contractor.Fairfax Contractor is your go-to company to encapsulate your crawlspace right here in Northern Virginia. Virginia. If you’re tired of a wet, moldy, unusable crawlspace we can help you transform this problem area of your home, into usable storage space. 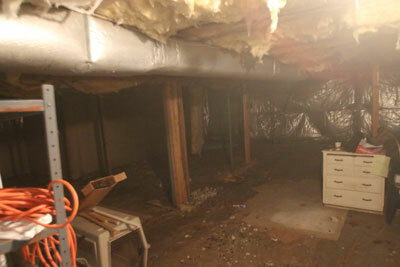 The methodology that we utilize to encapsulate crawlspaces is to first level and re-grade the floor surface. Once this is accomplished we will lay down #57 gravel, if it does not already exist. To dry out the floor, we will install a 35-gallon polyurethane sump pump crib. 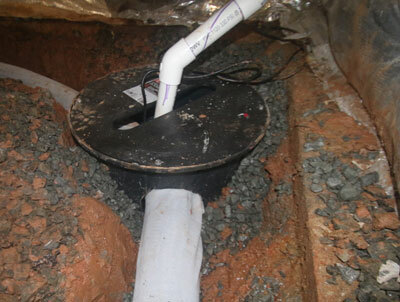 By utilization of lasers, we will excavate around the interior perimeter of your crawlspace, and install 4 inch perforated drain tiles that will tie in to the sump pump crib. The 4 inch perforated drain tiles will be installed with a nylon sock to keep sediment from building up within the pipe. The next step is to install a good quality sump pump, plumbed, to code. For more information about sump pump installations click this link. After the sump pump, and has been hooked up we will backfill the drain tile with the #57 gravel to cover the pipe. 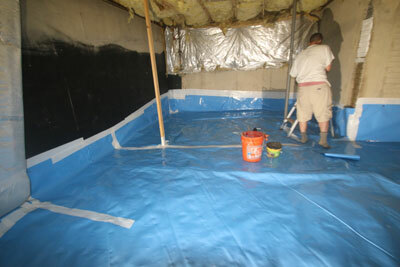 The next step is to lay down a 20 mm plastic vapor barrier over the entire area of the basement floor. This vapor barrier will keep the humidity and moisture from entering into your crawlspace. We will bring the plastic liner up two feet onto the foundation walls and a fix the vapor barrier utilizing rivets. Once the vapor barrier has been affixed to your foundation walls we will run a bead of good quality caulk to assure that no moisture escapes our encapsulation system. Two of our most popular upgrades to crawlspace encapsulation is to add a dehumidifier that will be set to control the humidity and evacuate directly into your sump crib, the second upgrade is to install a battery backup system for your sump pump. We will also, carefully check all of your foundation walls to make sure that there are no cracks where water can enter your home. Our expert team has the ability to seal up these cracks with either epoxy injection and/or hydraulic cement. 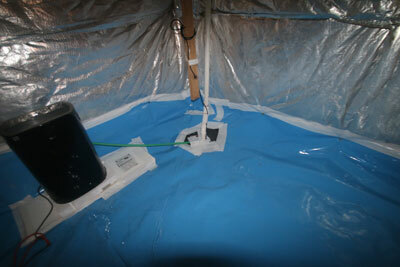 The utilization of this simple project will last for years and produce a dry crawlspace. One further note is that after we have installed your encapsulation crawlspace system, we will test the area for the presence of any mold. If mold is found we can certainly do mold remediation to make sure that we produce also a healthy living environment. Call us today at 703- 725- 7945 for a free consultation on how we can help you dry out your crawlspace. For more information on our waterproofing of crawl spaces click this link. Fairfax Contractor installs crawl space in Northern Virginia Counties including Arlington County, Fairfax County, Loudoun County, and Prince William County VA. We also do remodeling basement projects in the following Fairfax County cities including Alexandria, Annandale, Burke, Clifton, Centreville, Chantilly, Fairfax, Fairfax City, Fairfax Station, Falls Church, Great Falls, Herndon, Kingstown, Langley, Lake Barcroft, Lorton,McLean, Newington, North Springfield, Oakton, Oak Hill, Reston, Springfield, Sterling, Tyson’s Corner, and the Vienna, Virginia. Fairfax Contractor also is licensed to do work in Arlington County, including the cities of Arlington Forest, Ballston Crossings, Cherrydale, Claremont, Rivercrest, Westover, and Yorktown, Virginia. In Loudoun County, we install all types of home improvement projects in the cities of Ashburn, Aldie, Bristow, Dulles, Countryside, Lansdowne, Leesburg, Purcellville, Potomac Falls, South Riding, and Stone Ridge Virginia. And finally, we work in the cities of, Prince William County, including Dumfries, Dale City, Gainesville, Haymarket, Lake Manassas, Lake Ridge, Manassas, Manassas Park, Occoquan, Triangle, York Shire, and Woodbridge Virginia. 2017-Fairfax Contractor. All Rights Reserved.